For our first official book club post, I’d love to get to know YOU a little bit more! What was the last book club/Bible study you were a part of? Have you read “Holy Hustle” already, or is this your first time? What do you hope to get out of our time together? Is there anything I can do during THIS book club to help you feel confident to lead one on your own? Feel free to jump into the comments and share! Our first chapter today jumps us right into the heart of “holy hustle” – in order to adopt a new mindset about work or rest, we first have to acknowledge what we think of when we hear the word “hustle” so we can learn to let go of it. God can’t redeem something we’re not willing to give Him. Changing how you view an entire concept takes time, and I know not everyone immediately (or ever) grasps what “holy hustle” is all about. But I hope as you read through the book you’ll start to see that it’s always about doing everything we can to honor and glorify God as we love others. How are you starting to think differently about the word hustle? Do you find yourself more often on the side of striving or laziness? I shared several stories in this chapter – the story about Mark Cuban, my 7th grade teacher, Clare’s story – which one resonated most strongly with you? I’ll see you back here next week as we chat about Chapters 2-4! « Holy Hustle Book Club – Here We Go! •What was the last book club/Bible study you were a part of? It’s been way too long since I’ve participated in a Bible study and/or book club. •Have you read “Holy Hustle” already, or is this your first time? This is my first time reading “Holy Hustle” and am very excited. •What do you hope to get out of our time together? The title of this book is very intriguing to me. I am always open to learning new insights and clarity in how to balance my life. This is my first time reading Holy Hustle and I’m so excited. Finally a book that covers both work and resting! I am currently not in any other book clubs at the moment and the last book club I was in we were reading the power of positivity. This is my second time reading Holy Hustle. The first time was quick. I’m looking forward to taking my time and really thinking about it. I’d been reading other books and listening to podcasts about being successful and self-care and doing what brings me joy, etc… all of them relied on my inner wisdom and being able to know myself. All I know is if I have to rely on me and my wisdom, I’m in trouble! This is so different—right there in the first chapter—it’s not about me. I’m not responsible for the success. Takes a big load off. I haven’t been in any book clubs recently—too busy with the Hustle, right? Hello ladies!! So excited for this study! I just completed the study When Words Fail w/the Proverbs 31 Woman, which brought us through Chapters 1 through 72 of the Psalms. Amazing study and so many truths to glean from. This is my first time reading through Holy Hustle. I want to be able to build my business on the foundation of God’s Truths and to serve my community with my business and with God. I want to learn to balance my life and work life because I can totally get lost in my work. I most definitely do not want to be a god in my life. Hopefully, be able to bless other business women who love God and also who love their business. What was the last book club/Bible study you were a part of? I’m in a book club on Goodreads, and we just read Prince Caspian in the Chronicles of Narnia series by C.S. Lewis. I also just finished Live Life Again study with Proverbs 31. 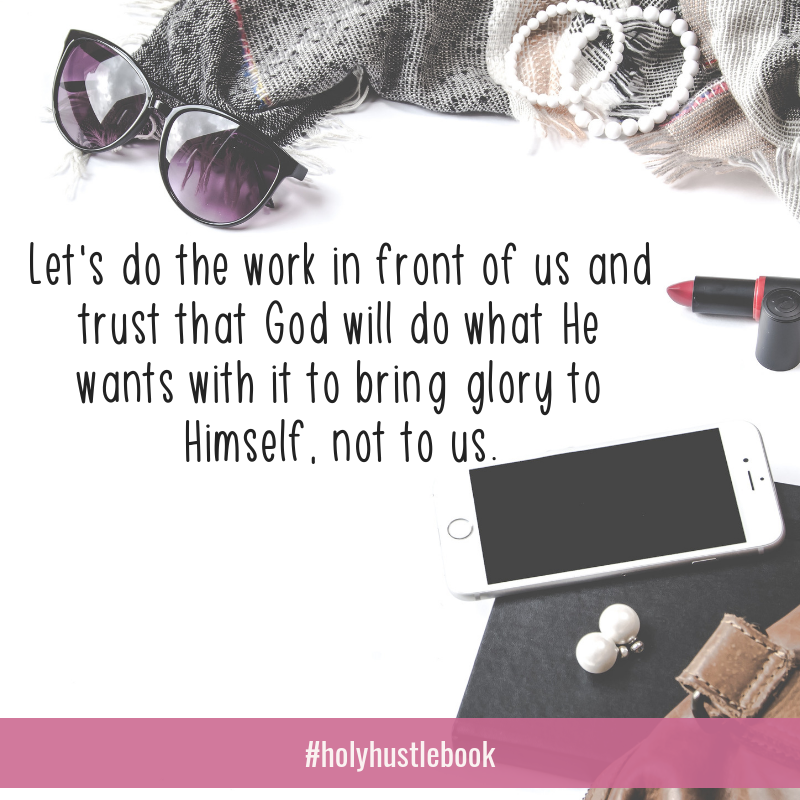 Have you read “Holy Hustle” already, or is this your first time? This is my first time. I’ve had it sitting in my To Read pile for months (since I won it in a contest) and keep wanting to start “as soon as I finish this one,” but then I signed up for a book review club, and I’ve gotten behind. What do you hope to get out of our time together? I hope to see the correlation between working hard and resting, balancing both. How are you starting to think differently about the word hustle? I haven’t changed anything yet, I’ve only finished the Introduction. 😉 I will read the first chapter this weekend–while I’m on a retreat up in the mountains!! Perfect timing for a vacation. I already read the book, but felt I needed to read again. I think reading it with others will bring more clarity on my personal holy hustle. I’ve always loved the word hustle – it’s kind of what I’m know. For in my “work life”. Your definitions of striving though caught me so off guard! In actuality, that is what I have been doing all of these years! Striving to go forward, not actually hustling at all! I read this book already and shared it with so many of my friends! It’s kind of a game changer for me. Can’t wait to go through it with you, and others, through this book club!